Region: Jersey Shore in Cape May, appx 40 miles south of Atlantic City. 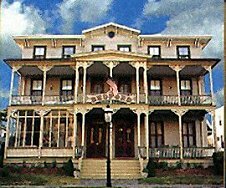 A "Mother-Daughter" twin home built in 1881 as a seaside vacation home, the Bedford Inn is beautifully restored and offers the peaceful getaway everyone needs. Just a half block to the beachfront center with on-site limited parking. 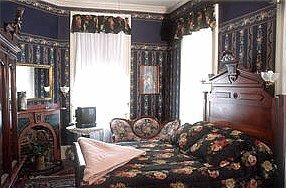 the inn provides each room and "honeymoon" suite with authentic Victorian antiques. All rooms have a private bathroom with a shower and some also have an old-fashioned clawfoot tub. Each room has touches of the new century with a/c, television and vcr. Most rooms offer a queen bed and two suites each offer a king. Cindy has been welcoming guests to her home for over 40 years and has been joined by her son James in welcoming their guests with the traditional warm Bedford Inn hospitality. A memorable breakfast each morning starts your day of sightseeing, beachbathing, shopping and exploring the special attractions of Cape May - a wonderful collection of unique Victorian architecture.